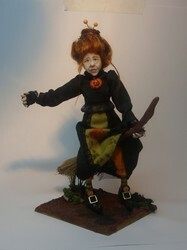 Handcrafted Dolls and Accessories by Debie Lyons – Doll Artist, sculptor and miniaturist. I have been interested making and creating ever since I can remember. After trying out all sorts of art and crafts I decided to have a go at working with polymer clay. So, a few years ago I brought a block of polymer clay for making dolls, I had a go with it and hated using it. It stayed in a drawer for a long time, then, one day when I was bored so I decided to try and have another go. After hours of practice, trial and error I finally made a little fantasy head and I haven’t looked back since. Initially I made lots of little fairies and elves not even realising that I was making miniatures. It wasn’t until I joined my first group that I realised that I was. I then discovered 1/12th and 1/24th scale and found that I preferred working in these scales and continue to do so. I am completely self-taught and an avid experimentalist. All of my dolls/figures are handcrafted and hand-sculpted; I do not use moulds. All of my work is made to a high standard and it is always unique. Although I make lots of different types and styles of doll and accessories I often find myself drawn to witches, wizards and settings including them. However, I still do, from time to time make the occasional art and fantasy piece. As well as AIM, I am also a member of CDHM and the British Polymer Clay Guild.